Should I hire a Claim Adjuster? 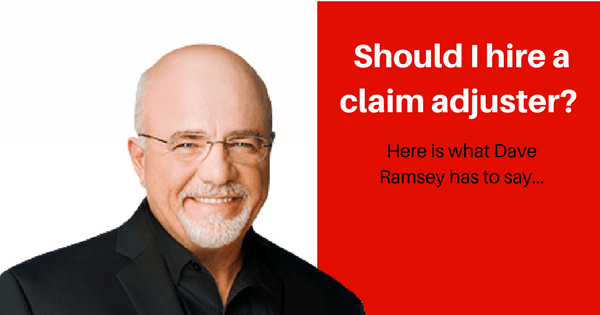 In a recent podcast episode (minute 31) from the Dave Ramsey show, a caller asked: “Should I hire a Claim Adjuster?.” Unfortunately, the lady’s $600k house burned to the ground when they were on vacation. So what was Dave’s response? Yes!…Because the inurance companies, depending on which ones they are, there is a degree of nastiness and they will completely play games with you on a claim that size…on somthing this size, they will nitpick you $100k in a heart beat. If you are filing for a Hurricane or any Property claim, your insurer may be leaving you in the dark. This is why you HIRE A PUBLIC CLAIM ADJUSTER! Who do you hire if you have tax problems? A CPA, right? Who do you hire if you have legal problems? A lawyer, correct? Well, in the case of property damage, you hire a public claim adjuster. We want you to know more about insurance, so we put together a list of things they want to keep from you. They Don’t Have to Pay Up—Even If You Deserve it! You must notify the insurance company 61 days prior to filing a lawsuit. Their weather-related damage liability is limited. Penalties for not paying enough in claims are reduced. Attorney fees are not covered unless you win the lawsuit with an award of 80+% of the damages. The change was made to deter property owners from exploiting damages with fraudulent lawsuits, taking money away from honest policyholders. While this may seem understandable, insurance providers now have protection for being stingy. In relation to the new bill, Ware Wendell—executive director of consumer rights group Texas Watch—stated that the new bill will influence insurance companies to pay as little as possible in a later timeframe. This will cause Texan property owners to have more delays and denials in their insurance claims to profit the insurance industry. Is it a coincidence that Hurricane Harvey is in the top 10 most expensive hurricanes in U.S. history to the insurance industry? Even if you are not a recent hurricane victim, Insurance companies will delay as long as possible and will want to pay as little as possible. After filing for your personal or commercial claim assistance, you might hear a representative say something reassuring like, “Everything is covered in your policy.” If you think it sounds too good to be true, it very well might be. A lot of policies have exclusions or limitations that are not always openly expressed when you make a commitment to a policy, requiring you to read the fine lines for full detail. So, when insurance companies say they have you covered, what they really mean is that they will cover everything that does not fall within exclusions or limitations. Adjusters will come out to evaluate the damage that needs to be reported for the insurance claim. It might make you feel good to see them write notes as you show them the damages and losses you have suffered. However, their best interest is in the insurance company. While they are documenting your losses, they are also looking for ways to reduce the overall value amount. It’s likely your insurance agent might not know everything about your policy, which can hinder your insurance claim. Have a policy copy on hand to protect yourself! After reading this, we hope your answer is YES!! Insurance companies don’t always want to be upfront about their policies, but Strategic Claim Consultants can help! We are a reputable Public Claims Adjuster who has helped in over 26 natural disasters and countless other disasters. If you have been hit by Hurricane Harvey, Irma or Maria, just go to the contact us page or you can go to the Hurricane Harvey or Hurricane Irma page to get help. You can also navigate to our publications page for more helpful guides to filing your claim.